any internal wall inside a room. Avoid direct sunlight and heat sources. home security systems, intercoms or telephones. operational problems for your air conditioner. The wall should be strong enough to hold the unit's weight. wants to install the indoor unit. Insert plastic anchors into the holes. Secure the plate to the wall with tapping screw. opening in the mounting bracket. that it needs to travel to reach the outside unit. Drill a hole that is 3" (7.5 cm) in diameter through the wall. Insert a flexible flange into the hole , if needed. 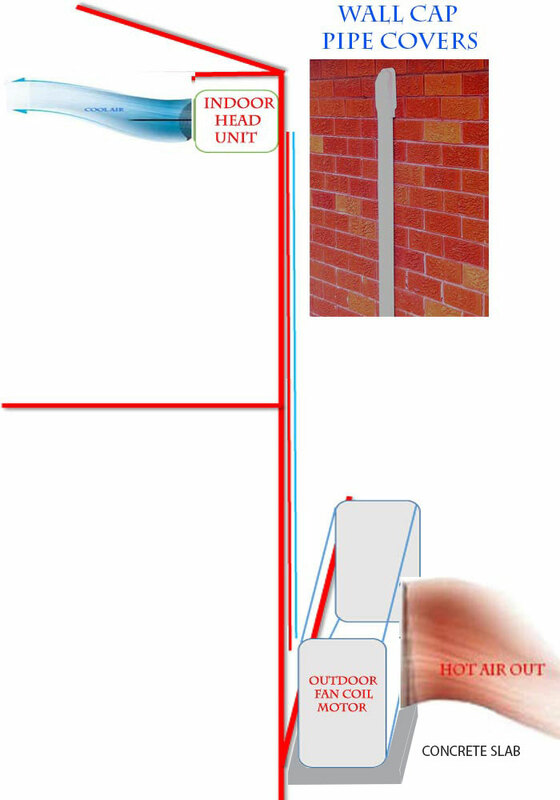 The Diagram on the left gives you an idea about how a back to back installation will look like in a single storey home. 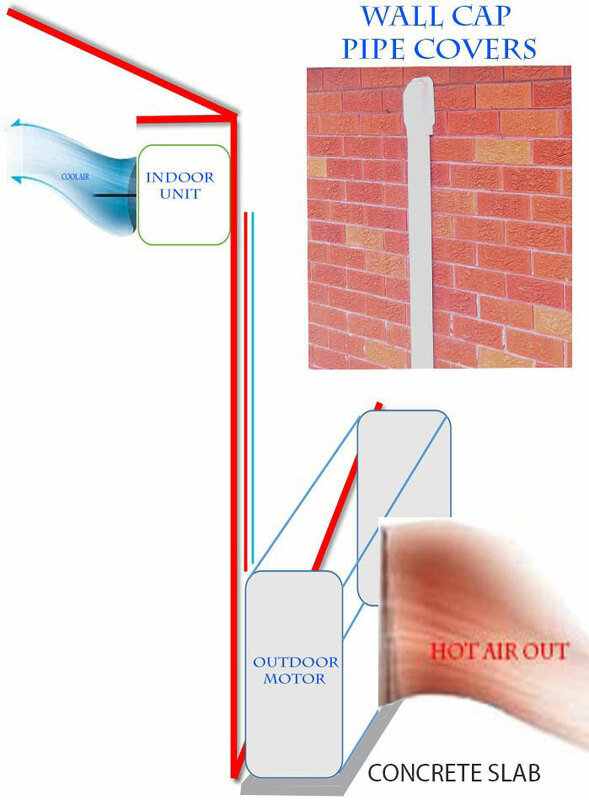 In most houses it is a simple and straightforward Split Air conditioner installation. A Split Air conditioner has two seperate components, which are called Indoor Head Unit and the Outdoor Fan Coil Motor. These two are inter-connected with copper pipes and electrical wires and a small tube for condensation water, which may drip out of the Indoor Head Unit, when you use it in (Summer) Cool Mode. Your Installation could be a "Back to Back" or You may need Additional copper piping to get the Outdoor Motor in a desired position. the Copper pipes, Electricals and Condensation Pipe. conditioners above 4 Kw cooling Capacity). The standard two-storey Split Air conditioner installation, which is having two parts, The indoor head unit and the Outdoor Fan Coil Unit is Simple and Straightforward in most cases. The Head Indoor Unit is Mounted on the wall of a house in it's second floor room. The Outdoor Unit is installed at ground level directly below the Head Unit. cap (See Photo) for the Copper pipework and Electrics. Capacity Split Air conditioners ). Air conditioning units are a source of noise complaints to all. 1. Inappropriately located Air conditioning units. 2. Air conditioning units that emit excessive noise levels. So, choose the most approprite location for Outdoor Motor unit, to prevent it from being a noise nuisance. New South Wales has laws to stop noisy Air conditioning units from being used where the noise is considered offensive to neighbouring residents. Air conditioner installation is multi-processed and very technical. In Australia, you will need to hire a licensed professional to install and service your Air conditioning system. These air conditioner installation experts have had relevant training and are licensed to handle refrigerants. 2. A restricted ‘splits’ license. NOTE: Relocation of Air conditioning units can be costly. So you should ensure in the first place that they are located in a position that will not adversely impact on any of the surrounding residents.